This entry garden near Hendricks Park in Eugene, Oregon is among our favorites, and we are excited to see it featured in this month's Sunset ('The Path Ahead,' p 49 and online). Unlike some of our more complex, colorful spaces, including other areas of the same property, this garden is striking because of its simplicity, a trait that not only inspired the design, but every decision and detail of construction along the way. Sometimes good design gets out of the way. For this garden, we took the unconventional step of demolishing the existing landscape before beginning design. Removing retaining and free-standing walls, arches and blocky plantings revealed signs of an original gentle grade through native oaks. The architecture of the midcentury modern house, now that we could really see it, was clean and quiet, and there was a minimum of necessary hardscape. The only practical goals we needed to accomplish were to follow the obvious route to the front door and to screen a portion of the driveway. In some situations, we might have massed colorful plantings or included a sculptural feature to add playfulness and energy to the landscape. However, our exceptional client and the wonderful "bones" of the space led us towards the serene, elegant result you see here. Of course, that doesn't mean that the design was easy. To quote Ron Lutsko, one of our favorite landscape architects, 'You have to think and think to get something simple." So, think we did. If there was an "Aha" moment, it was using a boardwalk and floating deck over the ferny hillside (a notion that had been looking for a home for some time) to draw the strong geometry of the house into the garden. By emphasizing the approach to the recessed doorway, we tied garden and house, integrating two spaces that had previously felt disjointed and making the entrance far more welcoming. The heart of this design is its simplicity, but its success depends as much on careful installation as on design. The trick of a minimal garden is that every detail counts. From the ground up, each part of the landscape's construction played an essential part in the final product. Once we had removed the clunky remnants of the original landscape, our first goal was to transform the previously segmented space into a unified whole. We regraded the slope, smoothing its terraces and divisions into a cohesive, natural grade that flows through the garden. The few "hard" elements of this space are perhaps its most eye catching and therefore crucial to its success. We used a string line to lay out the nail pattern in the deck and boardwalk to avoid erratic, distracting nail patterns. Likewise, we hand-selected and placed the (enormous!) basalt bowl, ensuring that its form and scale settled perfectly into the design. For the plantings, native Western Sword Ferns were an obvious choice. They are evergreen and their drought tolerance avoids excess irrigation on the native oaks, which prefer little summer water. However, selecting a plant for strategic screening was more of a challenge. We wanted something evergreen with a moderate ultimate height. We placed Fargesia rufa, a low, clumping bamboo, at locations where it would provide screening without feeling obtrusive or hedge-like. Simple, minimal design, in other words, is deceptively hard work. But well worthwhile. Eight years after all of that thinking, digging and string-lining, this garden remains a highlight of our portfolio and a reminder that sometimes less is more. How lovely to see a photo of the Suncatcher garden in Sunset's July issue! What makes this particular space catch the eye? This is just a simple sloping bed above a driveway, without especially dramatic features or plantings, yet many people name this image as one of their favorites. We think that three elements, one fortuitous and two by-design, give this space such wide appeal. 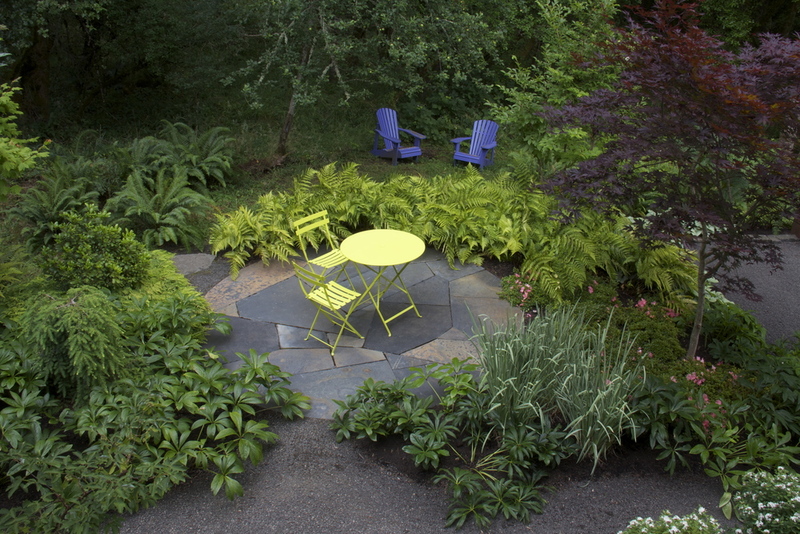 A seating area doubles as a focal point in this garden on the Oregon coast. A deck against the house is a convenient outdoor dining room, but there is nothing like sitting in the garden. Satellite seating areas reward a short journey through the landscape with a new perspective and offer a place to rest your eyes even when you lack the time or good weather to enjoy them in person. Without the defining structure of the house, designing an in-garden seating area can feel dauntingly open-ended. Location, size, shape and material are all up for grabs. Fortunately, we have some guidelines to help make a seating area your new favorite part of the garden. This intimate bench in Salem, Oregon is a lovely garden feature and the perfect spot to meditate on the view of Mt Jefferson. Satellite seating areas make ideal landscape focal points. Consider locations in view of your home’s primary doors and windows or other important points in the garden. A glimpse of a secluded bench might give your mind a break on a busy day. The view from the seating area is important, too. You can orient a bench or patio toward a scenic vista or a favorite perspective on the garden. Wrap the seating area in at least a few feet of planting bed to separate it from fences and property lines. Exceptions for gorgeous views are encouraged. Ample woodland plantings surround an oval-shaped flagstone patio in Eugene, Oregon. Put function first in determining size. How many people will use the seating area, and for what purpose? A fire pit with room for twenty is ideal for a family who entertains often, while a simple bench gives a quiet couple an intimate space for conversation or meditation. A correctly sized space will feel more welcoming, in addition to being the perfect fit for your needs. This 20' diameter circular, seating-height stone wall makes a fire pit for a crowd on the Oregon coast. This stone bench is just the right size for a family of two to enjoy their Eugene, Oregon garden. A circular terrace is the centerpiece of this shady space. Consider a geometric form to strengthen your satellite seating area’s impact. Rectangles, circles and even ovals make beautiful, grounding focal points as well as functional garden rooms. Don't worry if the design seems "hard" at first. Surrounding plantings will balance and soften any hard lines, while the shapes give definition to the design. In general, flagstone or a floating wood deck adds visual heft, while gravel appears softer and more informal. Bordering gravel with stone can add definition without hard paving. For a detailed look at paving, click over to our post, "Paving the Way"
A stone border adds visual weight to the rectangular gravel terrace in this front yard landscape. All photos by Mosaic Gardens. Compact and welcoming, low-maintenance but action-packed, the South Hills garden is in Sunset! The heart of this garden is our wonderful clients, who trusted us to reflect their dreams, and warm, open personalities in their little space (even when we brought ideas that surprised them). We couldn't be more grateful for their leap of faith. To supplement Jim McCausland's lovely article, we'd like to share some before and after photos and a little insight on the space's transformation from ho-hum yard to Sunset-worthy garden. Before: low, sparse plantings were overwhelmed by the facade of the house and the driveway. After: informal, breezy plantings wrap the house in layers of texture and color. Before: a lack of height and interest made the planting bed feel both cramped and exposed. After: plantings with varied height, texture and color embrace the entry and lead the eye into the borrowed view of the hills beyond. Before: a true blank slate, this empty yard lacked form, focus and screening. After: two garden "rooms" draw the eye, even when not in use, while plantings soften less desirable views and direct attention into the adjacent woodland. Before: overwhelmed by the tall facade of the house, and made unusable by the slope, the original yard felt like an afterthought. After: subtle terracing made room for two outdoor living spaces, while textural plantings give the garden depth and focus. We are delighted to see the Fairmount Garden pictured in Sunset's Northwest Garden Checklist this month! In honor of the occasion, we are sharing three of our favorite things about this lovely space. The People - This side garden straddles two properties and was once a thick laurel hedge. While many neighbors seek privacy and separation, these two families wanted to improve the warmth and openness of the space as well as access between the properties. We regraded the slope and added a basalt stairway and layered plantings. The stairs encourage frequent trips between the properties and remind us that not all good neighbors require good fences. The Slope - A steep hillside embraces the driveway entrance to our clients' home. Where the driveway might dominate the scene in flatter terrain, the slope allows the garden to take center stage. For inspiration and ideas for your sloping space, see our recent post on Sunset's Blog. The Textures - While the two previous favorites are thanks to happy circumstance, we have to take a little credit for selecting varied, interesting foliage textures. Soft-needled, droopy Tsuga c. 'Pendula;' waxy, broad leafed Helleborus hybridus; floppy, grassy Carex m. 'Aureovariegata;' spiky Iris ensata; and fuzzy Rhododendron pachysanthum are just a few of the plants that play well in and out of bloom. While there is almost always something flowering in this shady to partly sunny space, the contrasting leaves and forms provide interest year-round. This image shows just one part of this lovely, shady space. Visit the Fairmount Garden portfolio page for more photos and information. We selected low-maintenance plants with great foliage as a foundation on this slope, saving the labor-intensive high impact flowers for areas easily reached from an edge. Learn more tips for making a beautiful hillside garden in our new blog post. Our new guest blog post for Sunset is live! Discover how your sloping property can become the perfect landscape canvas in How to Create a Beautiful Hillside Garden. Marsh Morning by Molly Mabe 30" x 128"
My mother, Molly Mabe (note: site has audio), is best known for her oil on canvas landscape paintings. They are varied, intricate, and endlessly involving. On my best days of designing gardens, I like to think I am a little like her. Whether or not that is true, many of my best creative practices come directly from her. She did not teach these guidelines, so much as embody them. Being the lucky kid who watched her paint in her studio and comb the beach for sharks’ teeth, I absorbed her habits and practices in the way that kids do. Which is to say, I rarely appeared to be paying attention (“Mom, I’m booored. Can we go yet?”), but from a remove of thirty or so years I think and hope I was. Mom is the world's best noticer. While the rest of us are busily looking, but not really seeing, Mom is probably noticing something…. She might notice dry blades of grass in a marsh, how they move differently from the fresh blades or the way that they change the scene when viewed from a distance. On a larger scale, she might notice how September light influences the mood of a pond's reflection, or how the thickness of a palm canopy shades surrounding undergrowth. She is not an artist who carries canvas and easel into the woods, but rather one who absorbs everything, from detail to mood and brings it into the studio. Very few of her paintings are “from life,” most are invented from her nuanced sense of place. Trinity by Molly Mabe 44" x 36" Have you noticed the way that old palm fronds create unexpected shadows? My mom has. I try to emulate this skillful noticing, although I generally fall into more active observation. While in gardens, nurseries and nature, I try to take it all in, good, bad and indifferent. This is a quite different practice from learning, with the goal of imitation, and is rather more like gathering a palette of impressions to be recalled at the right moment. Sometimes years later, an observation will inspire a new plant combination or even a design. When people see my mother’s work in person, especially the large pieces, they often comment that they feel drawn into the painting. As befits a great noticer, Mom is keenly aware of how line, form and contour direct the eye. At times, she allows attention to scan broadly across a distant marsh, at others, she draws us along the tide line of a beach, around a bend or into the canopy. Viewers project themselves into that scene, and they feel surrounded by it, even though it is a two dimensional piece. Verical Beach by Molly Mabe, 60" x 48"
You are now walking on this beach, are you not? If Mom's work holds a clearly applicable lesson for my work in garden design, this is it. We all have busy lives, with little time to stroll through gardens. 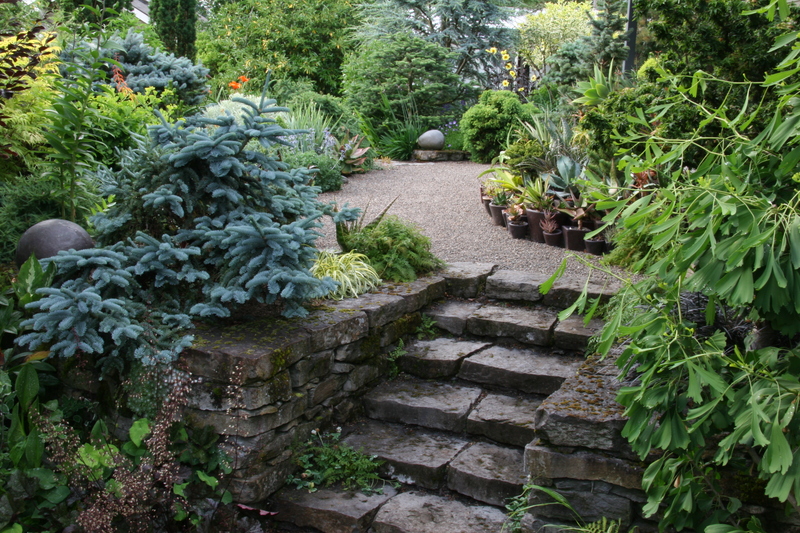 However, a path to a peaceful bench or a carefully curated planting captures attention. We use features, pathways, dramatic plantings and other three dimensional tricks (we have it easy) to draw the eye and imagination into the space, bringing people into the garden, even when they are not able to physically wander through it. Finally, for sake of word count, not completeness, Mom is curious. She is a student of Eastern and Western art history, and she experiments constantly. She may have painted a few marsh scenes, but each one is different, with some new aspect to keep her attention. She loves to play with scale. I have one painting that is perhaps eight inches, square. Another ambitious piece is 6 1/2 inches tall and 80 (EIGHTY!) feet long. It is a beach scene, moving from dawn, through day to dusk across three long walls, and it is more amazing than you imagine. She might paint koi swimming in lotus flowers or a pair of found birds’ nests. She decorated at least one minister’s stole. She could probably sell her doodles. As you might imagine, I prefer an embellished Post-It note from my mom to any store bought birthday card. Five feet by TWENTY feet. And perfect rippling reflections. Not everyone gets to hug their favorite artist. With her example, I have no excuse or desire for rubber-stamp design. There is always a new way to use the same materials or new materials to bring a point of difference to a design. Sometimes, when I am pushing myself to find a better, new angle of approach to my work, I sense a small, familiar spark - a combination of joy and adventure that, if tended carefully, can lead to the glow of inspiration that I remember from my mom’s studio. Thanks, Mom. Happy Mother's Day. What an honor to be interviewed for Garden Design magazine's spring issue. I love Garden Design's gorgeous and ad-free reinvention, and it was such fun to discuss one of my favorite topics, veggie gardens! I (Rebecca) am an aspiring vegetable garden aficionado. I have planted an edible garden for years, but am only beginning to comprehend the depth and complexity of growing food. Maybe I will feel like an expert in another lifetime or three. Time and experience in any garden will teach a few lessons, however, and I have developed a few tricks and techniques that would have been very helpful in my first gardens. The Garden Design article mentions two key concepts and now, I'd like to share a little tool that has drastically improved the success of my seedlings. A dog, cat and racoon deterring cage for vegetable seedlings. Vegetables love organic fertilizers and we have had especially good success with fish bone meal. Unfortunately, urban critters love bone meals as much as the plants do. Racoons, cats and dogs are very attracted to the smell and will dig up a patch of freshly planted veggies in seconds. Other organic mixes were not as successful in our garden, so we decided that our best option was to keep the critters out. Without further ado, here are DIY instructions for simple bent wire cages that will defend your organic veggies from intruders for years to come. The end of our wire veggie cages. Note the "loose ends" of the end panel wrapped around the main panel. What you will need: a roll of flexible welded wire (we found ours at the farm supply store), some pliers and wire snips. Determine the desired height and width of the cage. Snip a panel of welded wire that is equal to two times the height (the future "sides" of the cage) plus the width. Bend the cut panel along the two corners, to make the body of the cage. Measure the openings on the end and cut out small panels that are slightly larger than needed to cover the ends. Bend free wires from one panel around the edge of the other panel (see image). You could use another, more flexible, wire or zip ties for the same effect. In this case you can cut the edges to size, or as close as will allow a full-length wire on all sides to brace your ties. Last, but not least, deter stronger and more determined animals by staking the edges of the cages with wire irrigation stakes, called J hooks or U hooks, depending on shape. We remove the cages about a week after our last application of animal-attracting fertilizer, but those of you with particularly nosy or persistent intruders may want to wait a bit longer. We use J hook irrigation stakes to secure the veggie cages against more determined animals. And a bonus idea for varied row lengths: Our beds vary in size, so we built small cages that would work for the shortest rows, as well as extension cages that are open on one end. You can place the open end of the cage over a short cage or another extension to make a longer protective cover. The cages can also double as low cloche frames for cool season gardening. If the critters have been raiding your starts and seedlings, give these cages a try. Ours have consistently deterred dogs, cats, racoons, even after a generous sprinkling of fish bone meal. It's safe, humane and our veggies always get off to a great start. If you enjoy vegetable gardens, we have a big and, we think, exciting veggie garden project to share in a couple of months. Stay tuned! What fun to be a Guest Blogger for Sunset's Westphoria! Their blog is full of great ideas for home, garden and travel, as well as loads of pretty pictures (just like Sunset), so I jumped at the chance to write a few posts for them. They loved our post here, Paving the Way, and wanted to share it with their readers. Of course! Click on over to Westphoria to see How to Pick the Right Paving for Your Garden, and be sure to scroll through some of their other informative and beautiful articles. Meanwhile, I am hard at work on original content for their blog and this one. Check back here next week, and stay tuned for a Westphoria post with some great ideas for hillside gardens. One of our best gardens for this season, March 2015. Early spring can be a surprisingly tricky gardening season in the Pacific Northwest. Mild weather, new leaves and colorful buds send gardeners to the nursery, desperate to sweep up rows of fluffy, compellingly labeled plants. So why is it tricky? Here in the Pacific Northwest, we are still in the wet season. The delicate petals of many flowers fall apart with frequent moisture. When I think of spring, I think of my grandmother’s beloved Camellias. In Oregon, those intricate flowers become applesauce on a stick. Then, there are the endless, gorgeous cottage garden perennials that flower briefly and soggily, often requiring extensive staking, and then just keep growing. They express their love for our mild climate by billowing up, out and over neighboring plants through summer and fall, looking a little ratty, taking valuable space, and contributing nothing to the garden. So what’s a spring-frenzied gardener to do? The secret to a gorgeous early spring plant palette is to seek out plants that thrive in our enviable climate, rather than the “traditional” mainstays that are happier in another part of the country (or world). Below are a few guidelines to help you create a reliable early spring show that blends beautifully into the warmer growing seasons. Flower and Foliage power We love a multipurpose plant, and, luckily, some of the most colorful stars of the early spring garden are gorgeous throughout the growing season and beyond. From structural foundation plants, like deciduous magnolias, to vines, like spring blooming clematis, to low perennials, like hellebores, almost every plant form has some gorgeous early spring bloomers. The key to finding these diamonds is to evaluate their leaf and form in other seasons. One trick we use for a new-to-us variety is to search Google Images for photos of the plant out of bloom (e.g. “epimedium sulfureum summer"). The slideshow below features a few of our favorite early blooming perennials with great presence in the warm season garden, including Hellebores, Beesia, Brunnera, Euphorbia, Mukdenia and Pulmonaria. Poppies and Allium brighten the garden in spring, then quietly go dormant, allowing warm weather plants to take center stage. Disappearing Act If you can’t find the right early performer with fabulous foliage, consider plants that return to dormancy not long after bloom. These plants may not be best for the front of the bed, but they have the good grace not to bully nearby plants out of season. Poppies and many spring bulbs, like Allium leap to mind. 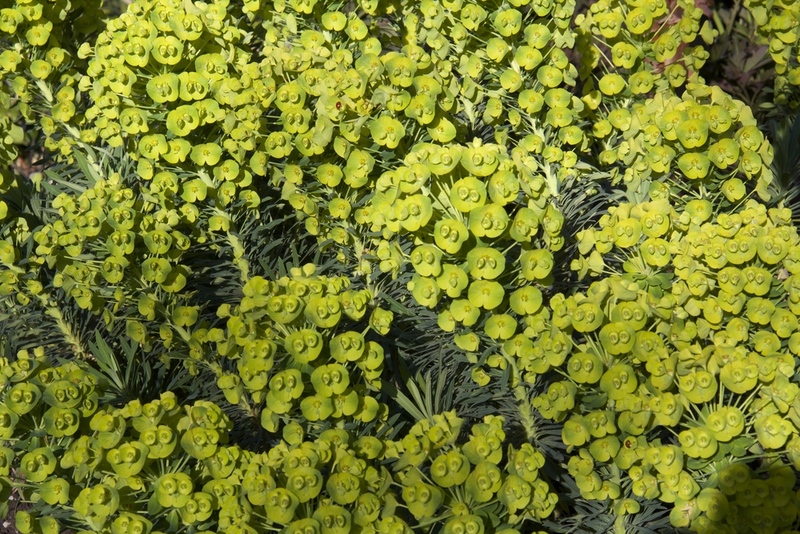 One of our favorites in this group is Ranunculus ‘Brazen Hussy,’ a low perennial, with deep dark leaves and bright yellow flowers. It dances through our upper gravel terrace in the early spring (so early we are already too late for a photo), then politely disappears completely as the heat loving plants hit their stride. Resilient Blooms The best early bloomers is their ability to perform beautifully through wet (or even snowy) weather. Plants with masses of tiny flowers, like Brunnera, are often full of color without splotchy, brown spots. Plants with larger blooms can be successful, as well, if they either drop weathered foliage promptly, like many deciduous magnolias, or have especially durable blooms, like hellebores. It can be difficult to tell which of the flowers in a greenhouse will maintain their appearance through damp weather, which is why we enjoy touring the demonstration gardens of our favorite nurseries. When we asked for your favorite spring plants, many of you answered "ferns!" Subtle, but dramatic. You guys have great taste. Dramatic Entrance Spring excitement is not limited to flowers, however. If you want an early season garden brimming with color and daily change, seek out plants that make a dramatic entrance. Many plants with huge, bold foliage, like Gunnera or Podophyllum emerge with vigor and seem to expand by the minute. And, of course, everyone loves watching ferns unfurl. The new fiddles of many varieties are fuzzy and even colorful. Other plants supplement the spring color palette with bronze, red or even burgundy spring foliage. A number of plants, including many Japanese maples and Epimedium, have intricately colored and patterned new growth that fades to green and then blushes with color again in fall. One of the 'Itoh' hybrid peonies. Gorgeous, in and out of flower, and stake free. Make New Friends, but Keep the Old Unfurling ferns and hellebore blooms are lovely, but sometimes we just want a good-old-fashioned Grandma’s spring garden flower. There are two remedies to this sort of garden nostalgia. The first is to seek out relatives that offer old style flower power in new, garden friendly varieties. Several of our clients have a sentimental love for herbaceous peonies. Each and every one of those clients adores the Itoh group peonies that we planted. A hybrid of herbaceous and woody peonies, the Itoh series has an impressive bloom size and structure, an absolutely gorgeous leaf and requires ZERO staking. The second remedy is not a remedy at all. Stop thinking so hard and buy that plant. Heck, buy three! If you fill your garden with excellent structure and year-round interest, you are well entitled to a few sentimental favorites. You might consider strategic placement, surrounded by reliable performers, but do put them somewhere you can enjoy them. They may not bloom perfectly every year, but every so often, they will be the stars of your early spring garden. Structure, long-season interest and a big, frilly, pink, and very much staked herbaceous peony. Fall is full of surprises. We design for winter structure, spring color and summer bounty, but fall garden highlights are as often unexpected as planned: bright ginkgo leaves in a perfect circle after a windless frosty night, the new-to-us salvia that waited until November to bloom, delicious, warm light filtering through seedheads on clear days and droplets on petals on rainy days. We embrace the chaos, allowing plants to drape, intertwine and gather the last of the fading sunlight. Soon enough, we'll begin the final fall rite of pruning and cutting back - putting the gardens to bed for winter. Below is a selection of fall photos from our phones. They aren't portfolio-quality shots, but perhaps they'll give you a sense of what we love about this season. Fall gardens in all of their unpredictable glory. The final images of a very late cardoon flower and an early hellebore bloom were taken on the same day in the same garden. A small flagstone patio and pea gravel paths working in harmony. Pathways and seating areas are as much a part of a beautiful garden as plants. There is always a need to get from Here to There, and most landscapes are enriched by a garden room. The materials chosen to pave these spaces become essential characteristics of the design. We find that natural materials, like stone and gravel, give the garden depth, weight and a connection to the land. In today's post, we are going to highlight a handful of our favorite options for paving materials, and give offer a few thoughts on their pros, cons and best uses. GRAVEL We only use "small" gravels for our paths, as they are easier to maintain and more comfortable underfoot. This elegant pea gravel pathway is enhanced and contained by stone borders. Pros: Quicker and less expensive to install than stone, although base prep is still essential, a soft appearance, can be integrated with plantings, local sources, can be used as a driveway surface. Pro-tip: Properly laid gravel rarely gets caught in shoes, but a small landing of a hard surface will help prevent pebbles from tracking into the house. Don't: Use weed cloth. Ever, for any application. Under gravel, it will make your base unstable and you'll get weeds anyway. Pea Gravel is little round river rocks, basically. We use a 3/8" gravel pulled from local rivers. Cons: Requires a border, a nearly flat subsurface and regular raking. Not ideal for a seating area where furniture will be scuffed across it or gardens where children and dogs will frequently run. Quarter minus gravel is a soft, low maintenance and lower cost option for a path or terrace. 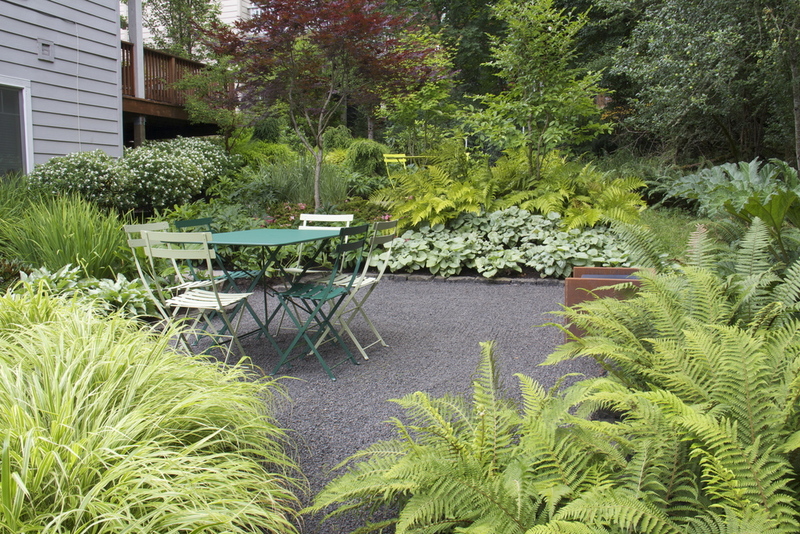 Its dark gray color looks quite at home in this shady, northwest garden. Quarter Minus or Quarter Minus Ten Gravel In our area, this is a gray, sharp edged basaltic gravel that comes from local quarries. The QM has "fines," meaning all of the small particles, which makes it a superior product for compaction. The QM10 lacks the fines, but its larger pieces make a nice "top dressing" for your carefully compacted base. Without the dusty particles, the QM 10 seems to show slightly more color variation. Pros: Requires less maintenance than pea gravel, does not require a border (although it does look lovely with one), and can be laid on a gentle slope without becoming slippery underfoot. FLAGSTONE While we can't present an exhaustive list of the excellent flagstones available in our area, the ones listed below are a few of our favorites. Cons: More expensive and time consuming to install than gravel or made-made materials. We don't have an excellent local flagstone, so all of our top options are brought in from other states or Canada. Pro-tip: In general, less expensive stone has surface irregularities that require more time to install. Don't: expect your stones to remain stable on anything less than 4-8" of machine-compacted base (more may be required, depending on the type of stone) and firmly question any source that says otherwise. The casual, but substantial appearance of Huckleberry basalt is beautiful, but furniture can be wobbly on its uneven surface. We solved that problem in this garden by installing permanent, cantilevered steel and ipe benches. Huckleberry Basalt is a light grayish, slightly bumpy stone quarried in British Columbia. Pros: Its slightly rough surface and irregular forms make it an excellent choice for woodsy and natural settings. Available in a stair tread, which allows you to use the same material for paving and stairs, if necessary. Cons: The irregular surface and slightly larger gaps required make it a less optimal choice for entry pathways and seating areas with movable furniture and entry pathways. The stones require some cutting and shaping to fit together into a tidy surface. The tan hues of Frontier Sandstone add warmth to this suburban entry garden. The availability of matching stair treads is one of the stone's many advantages. Frontier Sandstone varies from buff to dark tan with whitish patterning on some stones. Its surface is fairly flat and regular, with occasional humps and rises. The Frontier that we generally use is the "random rec," in which the stones are split into a variety of rectangular sizes. Pros: The rectangular stones require little cutting to put together. Another stone which is available as stair treads. Cons: Reaching here, but it is important to "grade" the stones, removing any with significant irregularities that would diminish the quality of the path. Aside from that, as with any stone, its appearance isn't everyone's cup of tea. Pennsylvania Bluestone has a nearly perfect, grayish surface. We use the "pattern cut," which is available in a variety of set dimensions. in this garden, a Pennsylvania Bluestone terrace and rusty steel retaining wall unite the contemporary lines of the house with the naturalistic feel of the plantings. Pros: There are few stones with such consistency of dimension and surface as pattern cut bluestone. It is a little like laying slate floor tiles. Really big, impressively heavy floor tiles. It is an ideal choice for front paths and seating areas. Cons: It does, indeed, come from Pennsylvania, which is a long way from Oregon. It is not available in a border stone or stair stone. Iron Mountain is a common flagstone with a flat, usually smooth, surface and colors that vary from deep grayish blue to rusty tones. Its irregular shape appeals to clients who prefer a less formal appearance. The varied tones of this small, circular Iron Mountain patio create a tapestry-like focal point from the house. Pros: Iron Mountain's generally smooth surface makes it an excellent option for seating areas and primary paths. Cons: Requires a fair amount of cutting to achieve tight gaps. Like the Frontier, some pieces are better than others, requiring careful grading in order to avoid warped stones. There isn't a perfectly matched, high quality stair stone. These are just a handful of our favorite options for natural paving materials. The best way to discover the right stone for your garden might be to visit a local stone yard. Lane Forest Products in Eugene and Springfield and Pacific Stonescape in Albany both offer a selection of beautiful stones. For further reading and inspiration, we recommend the gorgeous and informative book In the Company of Stone, by Dan Snow. Fall is creeping into the Pacific Northwest landscape. We are seeing color in the leaves and clouds in the sky. After a sunny, hot summer, the plants seem especially pleased with cooler temperatures and shorter days. The garden we built in Salem is always beautiful at this time of year. This summer's record heat scalded a few leaves, but the fall show is taking center stage. This snapshot includes a few of our favorite performers for the season, if not every season. The large, deeply cut leaves of Acer japonicum 'Aconitifolium' are gorgeous green throughout the summer and bring warm, deep color to the fall palette. This specimen is just getting started on a show of brilliant red and orange. The tree's open form and reasonable size nestles perfectly into many urban gardens. Daphne x transatlantica 'Jim's Pride' has been full of tiny, white flowers since summer, and shows no sign of stopping now. We placed these medium sized shrubs near the meditation bench, where our clients can enjoy their fragrance. We shear the semi-evergreen shrub in spring, which seems to help it maintain a more compact form. 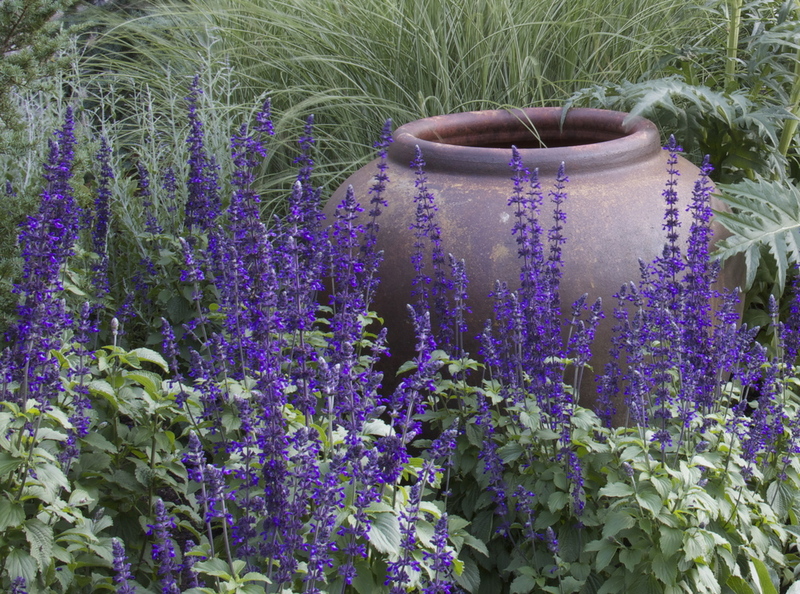 We can't go without our annual indulgence in Salvia 'Mystic Spires.' This sometimes-but-not-usually-hardy perennial blooms from May until the first hard frost. The deep purple spires are especially enticing to hummingbirds and other pollinators in the fall, after other blooms have faded. Soon, the Hakonechloa and other ornamental grasses will start to color, and next thing you know, the silvery, evergreen leaves of Helleborus x 'Sternii' will be holding down the scene. If we've done our work well, this will be just one beautiful moment among many in a multi-season garden. We hope you and your garden enjoy the transitional and transitory days of fall. Thanks for reading! Gorgeous, contemporary urban design. What's not to love? Do you have your tickets for the BRING Home & Garden Tour this Sunday? The self-guided tour focuses on buildings and landscapes constructed with sustainability foremost in mind. The WaterShed at 3rd and Mill is one of the featured projects. Here are three good reasons to see this fascinating mixed-use commercial/residential space on Sunday. 1. The building. The warm, light-filled, contemporary apartments and commercial spaces were created by a team of gifted local designers and artisans. The craftsmanship and attention to detail are incredible - be sure to admire the joinery in the woodwork, the welded railings, the gorgeous hand-built windows.... The building is a model of great design as well as green design. A not-so-boring drought tolerant landscape. 2. The landscape. Yes, Mosaic designed and built the drought-tolerant landscape, and we're proud of it! The exterior plantings, including the sun-baked "hell strip" are watered only twice per month in the summer, and rarely in other seasons. They're looking pretty good, even at the end of an extra hot summer! Grab a copy of the WaterShed plant list from the courtyard and get some ideas for your own drought-tolerant planting. For more images of the WaterShed landscape, visit our portfolio. 3. The fountain. We are also kind of proud of the rusty Corten steel fountain we designed.... It only runs during the day, and uses water from the building's rainwater catchment systems. We look forward to hearing what you think! A rusty corten steel fountain, designed by Mosaic Gardens. This private outdoor seating area wasn't always so pretty.... Scroll down. If you follow our Facebook page, you know that September is a big month for Mosaic: we will be presenting a lecture next Tuesday, the WaterShed will be on the BRING Home and Garden Tour, and Martha Stewart Living will release an article about the Coos Bay garden in their October issue! Tuesday, September 9, 7pm at the Campbell Community Center. Admission is free for members and $5 for non-members. Every landscaping project has its challenges. From hilly terrain to unsightly neighbors, sometimes the apparent difficulties of a situation can seem to outweigh the possibilities. Through years of creating gardens, we have learned how to overcome and even use design challenges to create beautiful outdoor spaces. The same tiny garden "before." The South Hills landscape presented its share of challenges! You may have seen Buell's lovely photos of this South Eugene garden and read a bit about its design and development. Below, we'll share some new images of the garden, as well as some of its challenges and our solutions. We hope some of our tricks and ideas will provide inspiration for your garden! A pocket-sized front garden welcomes visitors, including the local deer. The small, sloping front yard of this property used to look like the photo at right. As there was no need for hardscape, our challenge was to create a planted landscape that drew attention into itself, despite its diminutive size, and that balanced the tall facade of the house. Our deer-resistant planting intersperses taller ornamental grasses, Mountain Hemlocks and dramatic Cardoons among lower perennials, creating a layered effect that balances the scale of the house and higher elevation of the driveway. There is something blooming in almost all seasons, while varied foliage texture provides year-round interest. The clean lines of a large Vietnamese urn grounds the scene, providing a focal point from the street and within the house. A trio of planted pots warms the entryway, while layered plantings blend into the borrowed view beyond. It can be difficult to create an engaging, welcoming front garden when the primary entrance is through the driveway. The house and expanse of concrete tend to overwhelm the design. In this case, the design was additionally challenging as the front yard falls away from the driveway. Again, relying on plantings of layered height and contrasting foliage texture was key. In this case, the taller plants screen the street and blend into the hills beyond, making the space feel far bigger than it actually is. We also removed the iron railing that you can see in the before photo, instead installing a trio of large, planted pots that draw visitors to the front door while echoing nearby textural plantings. The containers have the same finish as the urn in the first image. We also maintained a palette of silver, purple, pink, burgundy and white throughout the planting. In a small space, a tight color palette strengthens the design, offering a simple, elegant effect. Mosaic fit two distinct garden rooms into this narrow back yard, using gravel as a primary surface material. Yes, the deer roam through here, too! In the shady back garden, we ran into a very common concern - budget. Our clients wanted space to enjoy their garden, but did not have infinite resources to devote to stonework and terracing. They had received a very expensive proposal from another landscaper for hardscape alone and were concerned that a nice outdoor living space might be out of their reach. Our primary solutions were twofold. First, we designed two small garden rooms that fit into the sloping landscape, rather than one large space that would require retaining. Our clients love plants, so they were delighted with that idea. Second, we paved most of the paths and open space with compacted quarter-minus gravel, using stone only as needed or as accent. Compacted basalt gravels stay put on a gentle slope, so we were able to minimize the stone stairs required, and are very low maintenance when installed properly. In addition to the stairs, we installed a simple black basalt border around the lower dining area, and built a small, but striking, circular stone terrace that doubles as a focal point from the house. Layered plantings and a gentle slope separate the nearby seating areas. Designing two terraces solved some problems and created others. Our most notable challenge was that, given the scale of the back yard, the seating areas had to be in close proximity. How would we make them feel distinct from each other? We wanted the spaces to feel comfortable and open to the rest of the garden, so walling them off with tall plants was not an option. Instead, we took advantage of the natural slope of the space, allowing the terraces to sit on different levels in the garden. Between the spaces, we used small trees, under-planted with shade-loving ferns, azaleas and perennials to create a gentle separation. We used deer resistant plants throughout the garden, because we and our clients wanted to keep the garden open to the nearby woods and wildlife. However, there is no such thing as a deer resistant vegetable garden. Our clients had figured out the sunniest spot in their mostly shady back garden and requested a small fenced space to grow a few edibles. Of course, the fence couldn't create too much shade, and no one wanted it to overwhelm or clash with the pretty ornamental garden. Our solution was to create a fence made of welded wire and steel posts, all allowed to rust. The rusty color almost disappears into the landscape, and, if noticed, provides a clean, elegant backdrop to the lovely space. A rusting steel fence is a quiet, elegant way to protect vegetables from deer. Thanks for reading! We hope you're enjoying the new site and journal format. If so, please share! Welcome to the new Mosaic Gardens journal! We are excited to reboot the journal as part of our new website! Upcoming posts include a tour of the South Hills garden, a list of great plants for fall, and some exciting Mosaic news! We have integrated the posts from our old journal below, with loads of images, virtual garden tours, and lots of landscape ideas and inspiration. Please excuse any formatting issues and broken links due to the transfer. Thanks for visiting. See you soon! There comes a time in every good garden when you can stand back and recognize that all of your hard work, planning and, yes, frustration is paying off. Joy and Steve Davey's garden has been a learning process (see our earlier journal article), but now that we've balanced the aesthetic goals with reality and a little time, the results are fantastic. The garden is having its first moment in the limelight in the current issue of Sunset (page 48! ), and there is more to come. Congratulations and thanks to Joy and Steve, who have given us the gifts of patience and inspiration in building and developing their garden. It will only get better from here! Ted and Nancy Dobson's Asian-inspired garden is getting a lot of attention these days! It is featured in the May/June issue of Fine Gardening, where you can see some of Buell's gorgeous photos and get a few ideas for your own small space from Rebecca's article. Subscribers will receive their issues any day now, and non-subscribers can pick up their copies at Market of Choice, Jerry's and some of the bigger bookstores on or after April 3. We are delighted for the Dobsons! While we helped them lay the foundation of their garden, they have made it absolutely their own. The garden reflects not just their eye for detail and hard work, but their joyful and peaceful personalities, as well. Congratulations on a job well and beautifully done, Ted and Nancy! Much more on the Dobson garden here.